There have been a couple of interesting articles on social media lately. Patricio Robles (Econsultancy) suggests that brands overvalue social data. Michelle Stinson Ross (Search Engine Journal) looks at graph representing the size of social networks – Twitter is down to fourth. Greg Finn (Marketing Land) cites a report that says Twitter is the fastest growing social network in the world. Emily Maltby and Shira Ovide (Wall Street Journal) report that LinkedIn and a more effective social media tool for small businesses than Twitter. Let’s look at the first bit of news: Robles’ question regarding social data. There has been a spate of articles, which I’m not going to specifically cite, that say that everyone involved in online marketing needs to reassess their approach to data collection and analysis. The consensus seems to be that marketers need to drill down into more specific data and change their metrics to get more insightful information that will make them more accountable to clients. It suggests that we need to place even more value on data than before. This seems to directly contradict Robles. Except, that it doesn’t when you look more closely at what Robles is saying. His view is that brands are over-reliant on irrelevant information. This is the data that doesn’t provide anything useful. Sometimes it’s used to fudge results and make it look like marketing tactics are earning great ROI. But, sometimes brands and marketers don’t know what they’re looking for or how to interpret it. What this means is that marketers need to sit down and really think about what information is important to them and then think even harder about how they’re going to get it. In a way, this is related to the next bits of news; the ones that look at the growth, size and effectiveness of social networks. It seems like it might be relevant to know that Twitter has dropped to fourth on the list of largest social networks internationally. It’s been surpassed by YouTube and Google+, which is now the second biggest social network behind Facebook. The results suggest that you should put more effort into Facebook marketing because its wider reach is more likely to deliver results. But if you drill down into your data, you might discover that Facebook is not the right platform for your business. 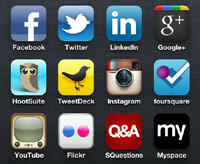 You could be getting much better ROI from Twitter, Pinterest or even MySpace. So, you need to keep investing in platforms that work for you. What about the fact that Twitter is the fastest growing social network? Well, what about it? It might be more meaningful to know that the percentage of active users has also increased. But the highest increase is in Hong Kong. Granted, the US is second, but the other countries within increasing Twitter populations are Russia, China, Italy and South Korea. You have to go quite far down the list if your market is English speaking countries. Again, it boils down to what works for you. Now onto social networks and small business. According to a survey by the Wall Street Journal, only 3% of small business owners think that Twitter has the most potential to help their companies. LinkedIn came out tops. It also seems like a relevant statistic. But what it really means is that owners find LinkedIn easier than Twitter to work with. It takes time to figure out how to properly leverage Twitter’s business potential; time which not many busy owners have. LinkedIn is far more straightforward for businesses, especially when it comes to actual networking. But it has limitations, especially when it comes to B2C marketing. So, once again the lesson here is you need to figure out what works for you. Your brand is unique; it stands to reason that it requires a unique approach to social marketing. The only way to refine that approach is to collect and analyse data. And the only way to make this process worthwhile is to determine what kind of data is necessary to help your business grow, and then create the metrics that will help you reach your goals.